June 27, 2012 / P.J. I was laying on the ground as a friend tossed discs into the basket. I was mesmerized by the brilliant blue background of the sky and just wanted to capture the disc as it started to rattle the chains. 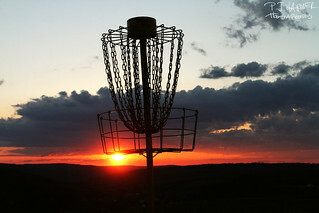 Disc golf is a fantastic sport to photograph. I’m pretty sure I’ve said that before. Expressions, action, the discs in flight — but it goes so much more beyond that. 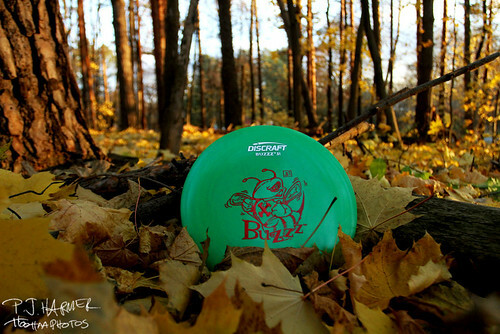 See, disc golf can be an artistic thing as well. The silhouette of a basket with a sunset as the background never gets old. Though the action shot is the ultimate, there’s a lot people can do with point-and-shoot cameras, a camera phone or whatever else to get a great image. 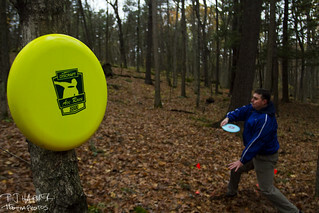 The big point is this, though — not all disc golf shots need to be action or with people in them. The beauty of this game is that baskets, discs and whatever else lend itself to having phenomenal shots. 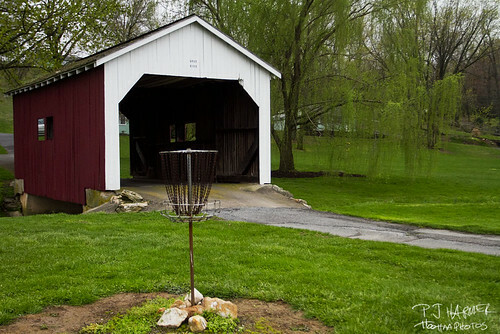 Think of the possibilities out there for images — cool-looking baskets; baskets with nice backdrops; the disc going into the basket (without a person present); discs in crazy landing spots; disc golf bags full of colorful discs. The list can go on and on. Now, I wouldn’t suggest you try and do all this during a tournament, of course. But during a casual round? Take a peek around. The first thing you need to think when doing shots like this is to sometimes ignore the action. See, the plan is to be artistic. These are the type of shots that end up maybe being printed and framed on your wall. You can easily combine action and artsy, if you get yourself in the right spot. These shots can also be the ones that capture the attention of a non-player and maybe garner enough interest where that person wants to try it out. First, decide your game plan. Yes, photos can unfold in front of you, which is a good thing. But, if you aren’t planning on shooting photos, you might miss it. 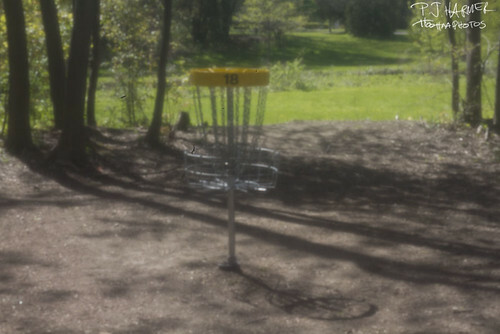 When I have a plan to take photos, I pretty much concentrate on that and the disc golf becomes a secondary part. I still play and enjoy, but I’m more concerned about watching everything around the game so I can find some artsy things. There’s no rule to say people can’t be in artsy shots. Remember, players don’t always have to be throwing a disc to be a great part of an image. The second way I do it is to plan just to shoot photos. I’ve gone with friends with a portable basket and set up some artsy and fun shots. Doing that gives us a chance to maybe do some urban golf or gives people the chance just to putt some as I work on the photos. Finally, the third way is to do it as I mentioned a moment ago — let it all unfold in front of you. Sometimes, the best shots can come when you aren’t expecting it. Just be ready with your phone or point-and-shoot or SLR for that moment. The big thing with artsy photos is there aren’t many “rules.” With action shots, you are in a box of sorts. You are trying to freeze the best action you possibly can get, such as a disc coming out of a hand or a great putting shot. Your parameters are smaller. With artsy images, there’s no box. It’s open to your mind, what you see and what you find is a great image. That also leads to the possibility of mixing the two. You can still be artsy with action and not make the action the “only” part of the photo. Be ready to shoot all the time. Cool things unfold in front of you and if you are ready, you’ll get the shot. Do different angles — low to the ground, above, from the side. Artsy shots aren’t always conventional. Don’t be afraid to get dirty on the ground. It gives you a unique perspective. 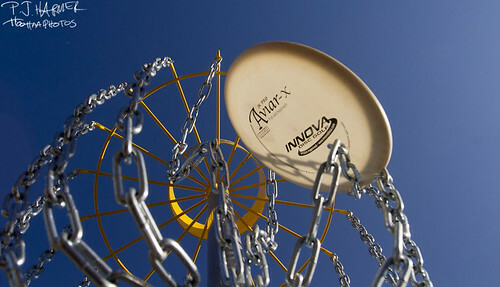 Look at discs, baskets and anything else disc golf — you’d be surprised how cool of a shot you can get. Set things up if you have an idea for something. Remember, there aren’t any rules to really speak of when dealing with images like this. The biggest thing I would offer when it comes to shots like this is to take chances. You never know what you’ll get. And it can be done with any camera. For example, the shot at the top of this post was taken with my DSLR. But, I also took many shots with my iPhone and they came out just as good. Even when using Hipstamatic. Now, I had a lot more “failure” shots because the shutter isn’t as fast, but I got a lot of workable and nice shots with the iPhone. One of my favorites — the disc landed this way and I had to capture it. 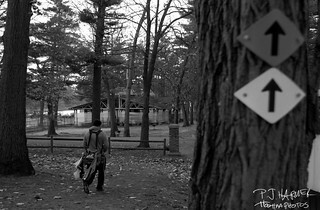 During a round in the fall. Glow discs we were selling for a fundraiser. My niece setting up for a putt with just the top of the final basket showing. Trying some old-school looks with a pinhole lens to give the image this look. When playing, always look at the baskets and the backdrop — you never know when a cool image will open up for you. The rest of the photography series will run in the coming weeks. If you have any thoughts/comments or suggestions of things you’d like to see covered in this series, let me know in the comments below or drop me an e-mail! P.J. Harmer is the lead blogger for Rattling Chains. E-mail him at: pj [at] rattlingchains.com. ← Poll 16: Are you fair weather? Angles are big for sure. And as for shooting all the time — if I’m not playing, I am snapping constantly. When I went to the Vibram Open, I took nearly 1000 photos over the course of the weekend. With digital, it’s the way to go. As for the rule of thirds… I don’t always agree there. In fact, that Buzzz photo of which you speak, I played around with it and hated it off-center. The rule of thirds is a good guideline, but I break it as often as I use it. Doing it with this shot wouldn’t have improved it, in my eyes. There’s no reason for there to be that space, I don’t think. It’s the beauty of that rule — some live by it, others don’t. I actually posted about photography rules on my blog today. Though I realized I use the rule of thirds more than I thought I did, I definitely break that rule often. These are some beautiful shots, P.J. You’ve got me wanting to invest in a decent camera to take on my many outings. Enjoyed the article. I always have my point and shoot camera with me while playing. During tournaments they are used to me saying “Oh wait don’t touch it I have to get a pic of that!” My friend says you always get me in shrubbery! Always looking for that different or crazy photo!